My skincare routine is pretty stable now and I have my dehydrated acne prone skin more or less under control. However, this doesn't mean that I'm spot free, depending on the weather, stress and hormonal level I will occasionally get cysts, pimples and whiteheads. A few years back I used to pick on my spots, I know very stupid, this increased inflammation and scarring. Luckily, I learned to stay away from them no matter what. So how do I deal with them now? The answer is spot treatment! Not everybody is a fan of spot treatments, many find it to drying, but for me its the only thing that drys out inflamed cysts. My firsts spot treatment was the famous one from Mario Badescu, later I moved on to Korean brands. Enca drying pinky powder and AC Clearing overnight spot are two spot treatments that I got from Wishtrend (see my Wishtrend haul post here) are now 'empties' on my dress-table, yes they are empty more precise the liquid is gone. 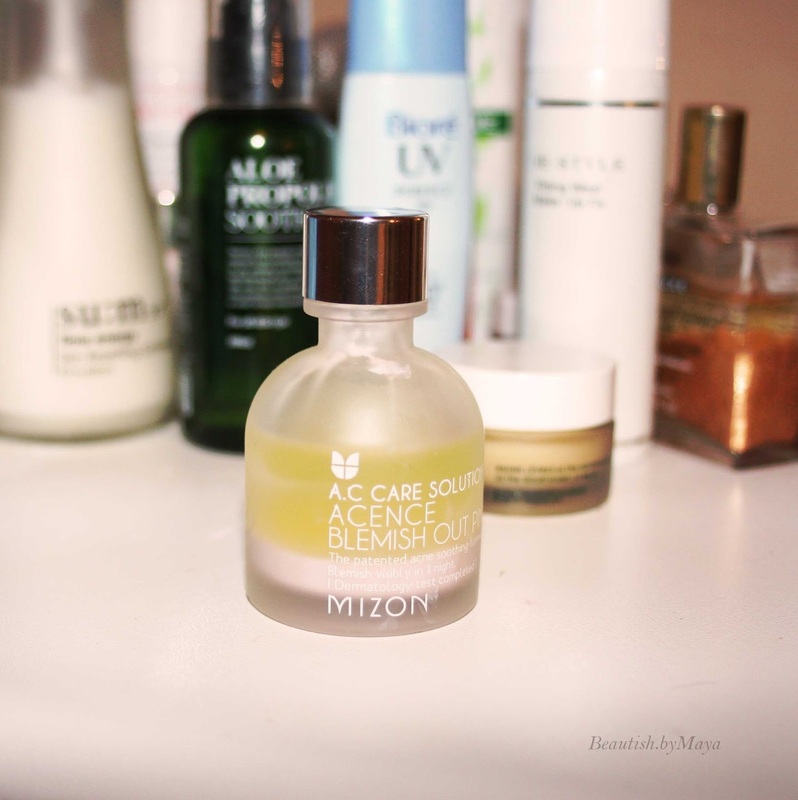 A recent addition to my collection is the Mizon Acence Blemish Out Pink Spot. Mizon is such an amazing brand and so affordable. 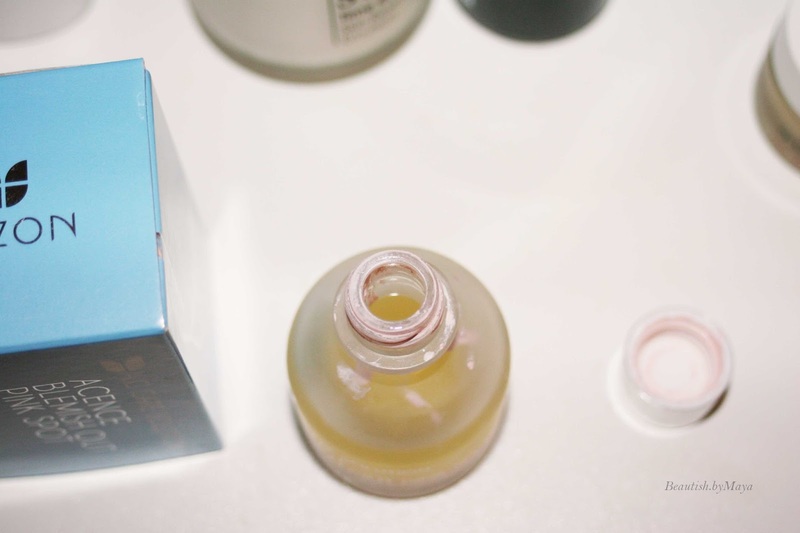 I believe many of you (interested in K-beauty) must have heard of it at some point, the brand is famous for their snail products. The Mizon Acence Blemish Out Pink Spot is lightweight overnight spot treatment formulated with AHA , BHA and calamine to heal and prevent acne. 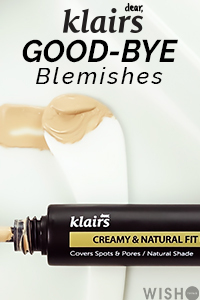 Ingredients: Aqua, Alcohol, Calamine, Glycerin, Titaniu Dioxide, Glycolic Acid, Dimethyl, Sulfone, Camphor, Peg-60 Hydrogenated Castor Oil, Salicylic Acid, Triclosan, Coptis Japonica Root Extract Propylene Glycol, rubus Idaeus (Rapsberry) Fruit Extract, Vaccinium Myrtillus Fruit/Leaf Extract, Citrus Medica Limonum (Lemon) Fruit Extract, Portulaca Oleracea Extract, Butylene Glycol, Pinus Pinaster Bark Extract, Theobroma (Cacao) (Cocoa) Extract, Hedera Helix (Ivy) Extract, Melaleuca Alternifolia (Tea Tree) Leaf Oil. As can be expected from a spot treatment there are some red flags when running the ingredients through Cosdna, nothing alarming if you can tolerate alcohol. To be honest I believe that the alcohol may not be an issue for you even if you are sensitive to alcohol, as you apply it only on the spot not your entire face. Calamine is one of the star ingredients, its a calming and soothing substance that also works as an antiseptic. BHA and AHA are active acids that help to exfoliate skin. Furthermore, I have to mention the Tea Tree leaf Oil that has antibacterial and antimicrobial functions. The product comes blue box with all the required information printed on it. The bottle containing the product is a round glass bottle of 30 ml. Many spot treatments are 15/20 ml (e.g Enca) so 30 ml is quit good. I really like the packaging it looks nice on my dress table. Its a two layer product, The yellow upper layer contains the active ingredients (AHA , BHA) and the pink layer calamine. Don't shake them together and if you do wait until the two layers separate. To apply it you should use a Q tip, first cover it in the yellow liquid and then dip it in the pink powder. Now with the product on the Q tip you can apply it to the desired area. I cover more than one spot with one use, a few pimples and closed comedones. When applied its first kind of liquid but dries down very fast. The staying power is very good, you can sleep with it and it will look the same next morning. 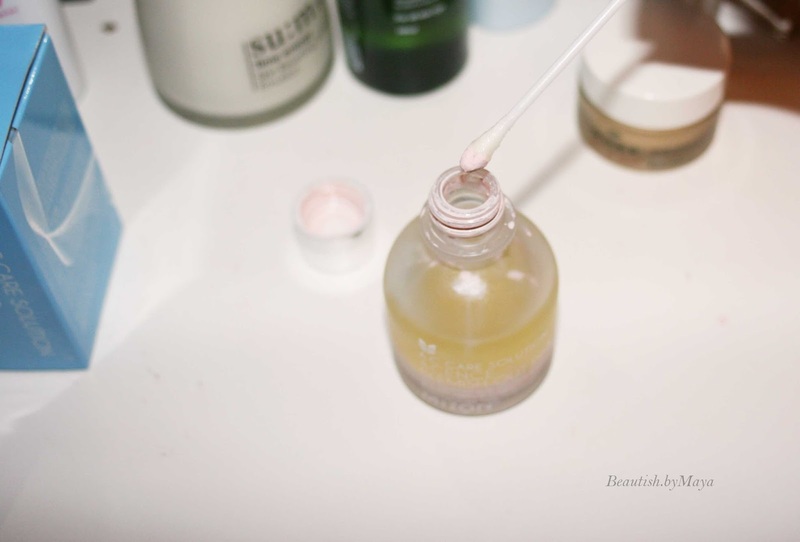 I apply the product with a Q tip after finishing my night time routine and maybe in the morning if I'm not in a hurry (remove it before make up). If there isn't enough product left on the Q tip you shouldn't dip the same Q tip into the bottle its not hygienic. I apply it on wit-heads, pimples and cysts. It works best on whiteheads and raised red bumps, spots that are about to form. The product dries out whiteheads, next morning I can see them disappear or becoming dry and coming to surface. On red bumps it prevents them from forming into spots, the redness will go away in a day or two. With Cysts its a little bit more difficult, the product takes down the redness,swelling, smooths the area, and helps it come to surface. I have noticed that cysts disappear much faster with the pink powder, a couple of days instead of weeks for me. Is it better than other spot treatments? Well, its much gentler and less irritating than the one from Mario Badescu but Enca (20$ for 15 ml) and AC (20$ for ml) are also very good. 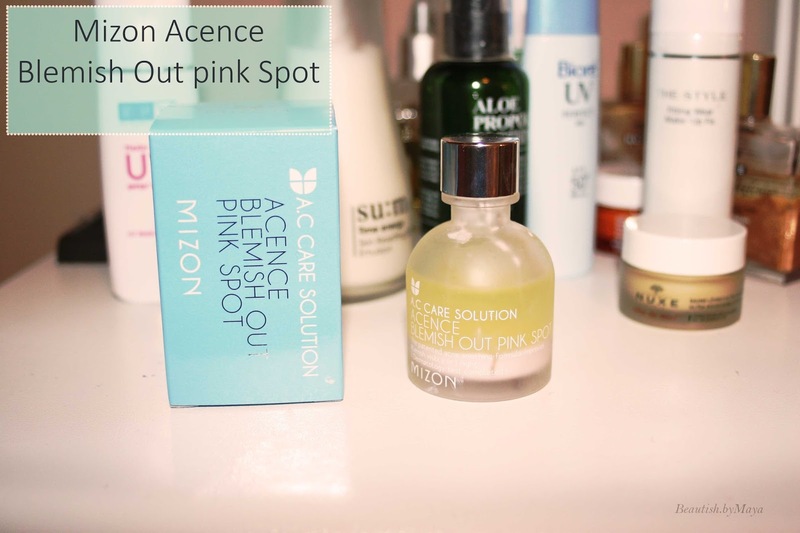 Still, I prefer the Mizon Acence Blemish Out Pink Spot because of the price/value, 16$ for 30 ml. Overall, this product is perfect if you want to treat spots or prevent them from forming (on red bumps..). I also find that besides treating the spot it prevents me from picking on it. You can buy it at amazon for 16$ (affiliate link), Jolse for 15$, there are also various sellers on ebay selling it for a good price. effective treatment for spots: whiteheads, cysts and red bumps . reduces redness and swelling, prevents or brings it fast to head. *Some of the links in this post are affiliate links. Shopping with them supports the blog. Looks very good for acne prone skin . I think its a good budget dupe for Murad pink powder for acne. Nice review dear. I just started following you on GFC and Bloglovin :) Hope you can follow me back.